I recently attended my third Hood River Fly-In and I have to say this event keeps getting better and better. This year I chose not to volunteer, unlike last year. There was more going on this year making me a little less certain that I’d be able to make it, as well as I wanted a little more freedom to photograph. I do feel a little guilty for not helping out, but some other opportunities to help unexpectedly arose. By Friday afternoon, I was already getting reports that there were many airplanes there and I was fairly certain from this report that it was going to be a great event. The Parker Pusher was scheduled to fly early Saturday and Sunday mornings, so I made plans to get there very early. I arrived in plenty of time and met up with a photographer friend of mine who had done much work around the museum. We made arrangements to chase the Pusher in a pickup truck for its takeoff run and be in position for its landing. The chase on the takeoff run didn’t work out as well as hoped, but we were expecting other opportunities. Unfortunately, it didn’t turn out that way. It was time for the Pusher to return from its first flight and I noticed that it had turned really early for the runway and the propeller was getting very slow. I was so focused on getting the shot that I wasn’t really hearing the radio, when suddenly the driver said something I didn’t catch and drove off quickly for the trees at the edge of the field. When we reached the trees he braked and swung us back around so we could see what was happening. We got turned around just in time to see the Pusher make a turn on to the runway and the skid at the tip of the wing caught the runway, spinning the plane around on to its landing gear. Turns out, the only damage to the plane was one of the wheels broke all its spokes. The pilot was ok, but it sure did scare us. The rest of the event was just a great deal of fun photographing a wide variety of planes. To my knowledge, it was the biggest Hood River Fly-In yet. Make a plan to come next September. 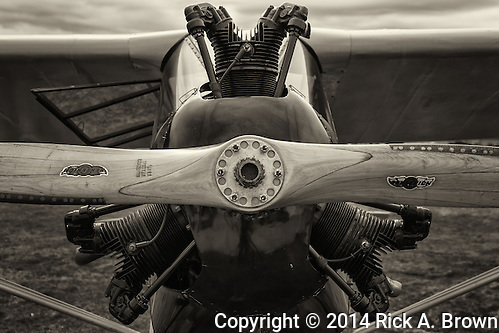 Check out the rest of my images of the 2014 Hood River Fly-In, or my aviation portfolio. In working on my book, I’ve been doing a great deal of research at the Oregon Aviation Historical Society, located in Cottage Grove. It is a friendly little museum, dedicated to the preservation of Oregon’s unique aviation heritage. Thus, I happened to get advance warning on a new event they were planning. It took place on June 28 and was titled 1st Annual Cottage Grove Wings & Wheels. The general idea was to have a plane displayed alongside a car of roughly the same time period. This concept sounded intriguing to me and I was anxious to see the display. The event was planned quickly with roughly one month of preparation. Thus, expectations were modest. Thanks to the hard work and dedication of the staff, however, the event exceeded all expectations. There was a good number of airplanes and cars, lots of friendly people, good food, and everything went smoothly. The only negative in my experience was the uncontrollable factor of the temperature. It got quite warm; the most popular food item at the event was root beer floats. As the event, was so much fun in its first year and every expectation is that it should be better next year, I expect it will be an absolutely incredible event in 2015. Make sure you watch for notice of this event and put it on your calendar. A good way to do this is to sign up for the mailing list at Oregon Aviation Historical Society. 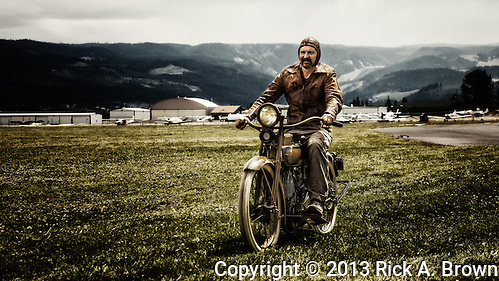 Take a closer look at my photos from the 1st Annual Cottage Grove Wings & Wheels, my Aviation Portfolio, or Automotive Portfolio. The October Second Saturday at WAAAM proved to be a day full of surprises. It all started with the weather. On the drive there, it seemed absolute that WAAAM’s perfect of no rain during Second Saturday hours would be broken. The sky looked truly ominous. Surprisingly enough, it did not rain during the activity hours, although it had shortly before. The next surprise was hinted at while I was helping out by setting up the lunch room. We could hear a fairly large jet powered helicopter landing at the field, but assumed it was a just a quick stop and nothing particularly interesting was happening. After setting up the lunch room I began to wander about taking photos as I always do. When I broke for lunch, the chief pilot, Ben Davidson, informed me that the TG-3, a WWII training glider would be going up for its first flight with WAAAM. This was also a surprise. I expected a Parker Pusher taxi test, but didn’t think anything else aviation related would be happening that day. Unfortunately, I jumped the gun a bit on getting over to the field for the glider flight, causing me to miss the pusher taxi test. When I got over to the field I came upon the other surprise. A Sikorsky Jayhawk was there from the Astoria Coast Guard station to give some search and rescue volunteers some training on helicopter extraction of folks in need of rescue. This provided for some great opportunities to photograph their training exercise and the weather was a nice bonus for this as the stormy skies were very evocative for that sort of image. I finished up the day by photographing the first take-off and several landings of the TG-3. The best location for take-offs was not the same as the best for landings, thus after the first I had to make a decision which was the focus. I preferred the glider not being towed, thus I chose the landings. For these photos, nicer weather would have looked good. Yet I really like how I was able to get recognizable images of all of the various pilots in the craft. It is also interesting to watch a glider and learn that they are not nearly as quiet as one might expect. 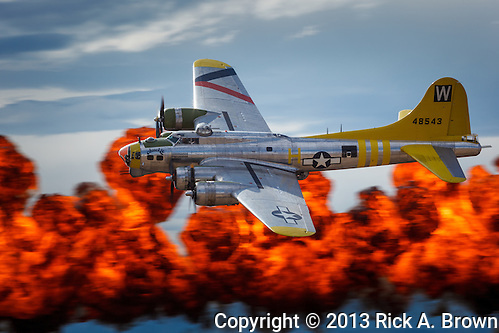 Take a closer look at the October WAAAM Second Saturday images, or my Aviation Portfolio. Studebaker Saturday from Rick Brown on Vimeo. This month at WAAAM’s Second Saturday, I decided to do something a little different and concentrate on video. I planned for several weeks developing a storyboard in my mind about a specific story of the planes. As the day got closer however, I started hearing troubling things about the weather forecast. WAAAM has had a perfect record on not being rained out on Second Saturday, so I had faith. This Second Saturday was also to be Studebaker day, so I was also going to produce a video just relating all the fun we had that day. As it turned out, the weather was fabulous except for being cold and windy. This resulted in the flights being grounded for the day. Thus, the primary video I was planning got scrapped. This video of the other activities, is pretty cool though, it only lacks the really tight narrative that the other would have had. It is still a lot of fun, has beautiful clips and gives a good feel for how much fun the day was. Video is becoming an increasingly important part of the imaging world as electronic media is taking over and viewers do like to see the moving image when possible. Recently, I became a member at WAAAM. As a staff member there mentioned to me, I’m there so often that in the long run it will probably be less expensive for me. Not to mention, I hope to become involved with some volunteer work around there, although the distance to the museum and my focus on my career would mean that a regularly scheduled volunteer commitment would probably be impractical. Thus, when I went over to the museum for the Second Saturday in March, it was my first time to be there as a member. When I arrived the woman at the front desk recognized me and knew that I was now a member, so she checked me in before I even got out my membership card. Once in the museum, many of the staff and volunteers made mention of me joining the museum as I walked around. (Not all were aware, but I’m sure it was greater than 50%.) I consider this fact to be illustrative of how friendly a place WAAAM is. As far as the Second Saturday event itself; the weather was beautiful, perhaps a little too beautiful for a photographer. I did my usual of photographing the airplanes and cars that were outside for the day’s activities, with the major difference being that there was a fairly good opportunity to photograph the Waco APO as it was determined that it was easier to get the YPF out to fly by pushing the APO outdoors first. One of the APO photos is what I’ve decided to use as my cover photo for this collection of images. The presentation for this Second Saturday was about navigation for airlines circa the ‘40s and ‘50s. This presentation was immensely interesting and I think it’s safe to say that everyone is glad for modern navigational tools. While at the museum, I ran into some photography friends. I didn’t know they would be there, but had a feeling they might be. This led to a friendly dinner at the end of the day, an always welcome way to conclude a great day at the museum. All in all, it was a fantastic day. Take a closer look at my images from the March, 2013 Second Saturday at WAAAM. I’ve totally obsessed about the Waco YPF-6 in WAAAM’s collection since I saw it for the first time last year. I researched every possible story I could find online about this wonderful plane, especially this one. Thus, when I heard that it would be pushed out and flown as part of the Second Saturday activities on 1/12/2013, I made absolute sure that I made to the event to see and photograph this amazing plane. The weather that day was interesting, here in Salem we had freezing fog, making the beginning to our trip a cause for anxiety. When we got there, we immediately went to the back of the main hangar where the maintenance on the YPF was being finished. Museum personnel were reinstalling the engine cowling and this step took longer than anyone would have predicted. We sat and watched and photographed this process until it was completed, well in addition with visiting with photography friends. After the maintenance was completed, the plane was pushed out and started. The engine run-up actually, went much faster than I anticipated. I guess I’m used to some really long run-ups I’ve witnessed on some of the old warbirds. Then we watched the plane taxi out to the runway and fly around the valley for a while. It was quite cold, around freezing, so when the Waco turned such that the propwash hit you as it was taxiing, it was rather chilling. Upon the plane’s return and its return taxi is when I made most of the images you see here. Although, a few were made later in the day immediately prior to closing. The other big draw for me to this Second Saturday was the presentation by Tukegee Airman, Ben “Flaps” Berry. I have always been very concerned about the gap between what the mythical America and the real one. The Tuskegee Airmen were true heroes in the fight to narrow that gap, as such, I find their story to be truly inspiring. The surprising thing was from my perspective, Ben’s postwar aeronautical engineering career was every bit as inspiring as his war career. I bought Ben’s book and had it signed, allowing a brief conversation with the man. I felt very privileged to meet such a man. I suggest you take a closer look at my images of WAAAM’s Waco YPF-6. In February, WAAAM will be having a fashion show of women’s military uniforms as the headline event of the Second Saturday. I will be attending this event as well and this time will be with some other aviation photography friends, promises to be a fun day. Recently I made another trip to Chanticleer Point in the Columbia Gorge to photograph the sunset on Vista House. I am looking for a specific image with dramatic clouds behind the Vista House lit by the warm light of sunset. On this recent trip I got some pretty good images but still not what I wanted. There wasn’t enough clouds and there was too much smoke from wildfires in the region. I have rarely done night photography, but since I stuck around a little while for the rising Harvest Moon, I thought I’d stick around a little longer to get some night images of Vista House. 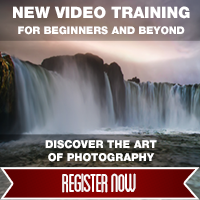 I shot using Live View and exposure simulation with the histogram. This made shooting the night images quite easy up until the necessary shutter speeds exceeded 30 seconds. When the required shutter speeds exceeded 30 seconds, I changed the aperture to get the histogram I needed. Then I recalculated what shutter speed I needed to get back to f/16. I then used a watch to time the exposure manually. I nailed the exposures. These night shots were awesome. As you can see, they have a great purple glow to them. The house itself is glowing from within with its incandescent lights and traffic on I84 shows as great streaks of light. I now want to go back for some starfield shots over the Vista House. Problem is since the night in these photos, clear nights have been quite rare. Take a closer look at these Columbia Gorge photos.